Blog Home > DIY and Home Improvement > Can you Tell Death Watch From Woodworm? Can you Tell Death Watch From Woodworm? Well of course woodworm is really a beetle – although it does quite a lot of its damage in its larva state, which is when it looks most like a ‘worm’ hence its common name. Find out how to detect and diagnose wood-boring pests in your home with our new project about woodworm. If you notice holes in your furniture, floorboards or rafters you might be really concerned that they are doing structural damage to your house or furnishings. It isn’t likely to undermine the structure of your home unless it is left for a very long time, but it might be a sign that all is not well with your timbers, and shouldn’t go unchecked or untreated. If you have noticed that you have a woodworm or other infestation, then it may be an indication that there is rot in the wood. Rotten wood is softer and so is a more habitable environment for insects. As the wood gets damp the grain swells and allows insects to easily burrow into the structure of the wood to lay their eggs. When the eggs hatch the larvae spend time inside the timbers while they mature, and their burrowing can cause structural weakness over time. Especially as by opening up the surface of the wood allows mould spores to more easily take hold. 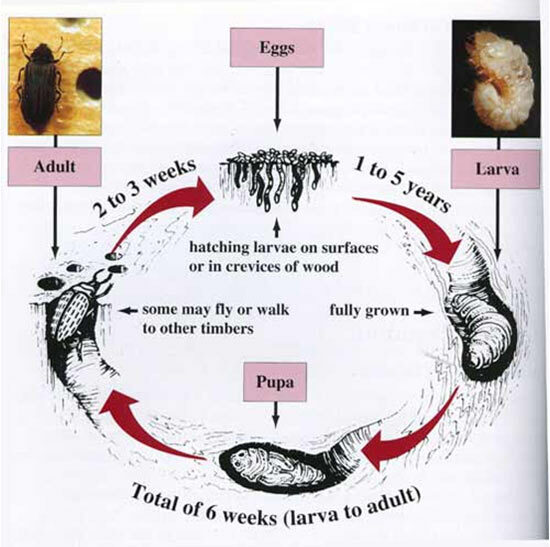 See the image above which shows the lifecycle of the beetles and how long they take to go through each phase. You can treat both damp and insects with a boron mix which is relatively safe and pleasant to use, meaning that you could tackle the job yourself quite easily. We teach you how to go about treating timbers for damp and woodworm in the main project. However if clambering about in roof spaces isn’t for you then you can always find an experienced, reliable woodworm specialist – find out how to employ good workmen on our main site.